'Eight Ball -- Corner Pocket' by Langdon Oliver - DPC Prints! I think this was more of a luck shot than anything. 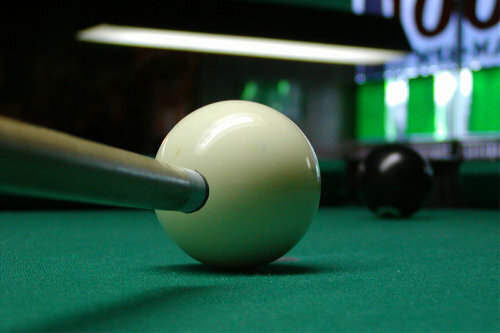 I did spend some time, framing and composing it, but only the foreground (stick, cueball, eightball). The background turned out much better than I'd expected (or even noticed at the time), and I was sure I wanted to submit it for the Table Shot Challenge. Credit goes to Chris Johnson for holding the pool stick and being patient. If I remember correctly, I sharpened, resized, despeckled, and sharpened again. Spot edited the orange lights from the original. Also cleaned up the pool stick (the angle/DOF seemed to skew it a bit). This photograph originally appeared in the Table Shot Challenge.